Eau de Cartier Vétiver Bleu is the latest of Cartier's flankers to 2001's Eau de Cartier. The original Eau de Cartier is a perfectly serviceable, well-made cologne (from perfumer Christine Nagel, by the way), the sort that everyone needs at least one of. I was tempted to buy it more than once, years ago, but eventually filled the category with other basic colognes I liked better (Eau de Guerlain, for instance). Cartier has done any number of likewise well-made flankers for Eau de Cartier, and I've been tempted by some of those as well, especially the recent Eau de Cartier Zeste de Soleil. If they did a coffret of 15 ml bottles of all of them, I would not be able to resist, but so far, no coffret. The series is marketed as unisex, but the individual scents tend to skew one direction or the other; you can probably already guess that Vétiver Bleu skews somewhat masculine. In addition to the vetiver of the name, it's got mint, licorice and menthol "accents". The start has a nice sparkle, and quickly takes on a woody vetiver base with the mint, licorice and menthol all in evidence, but lightly so. The vetiver dominates, but it too is soft and blurred, and while I've seen it described elsewhere as earthy, it's not earthy in the way that a vetiver fiend (e.g., me) would define earthy. Indeed, the whole thing is soft and fresh throughout, and while it does not smell massively ozonic or like laundry detergent, it has a definite modern / synthetic fresh vibe that will either please you, or it won't. The lasting power is quite good, but not much of interest happens after the first hour. It sweetens a bit as it dries down, and eventually the sheerest little dusting of talc makes the already hazy components get hazier still. Verdict: I liked Vétiver Bleu when I first smelled it. I still liked it when I wore it the second time. Wearing it several days in a row, and "concentrating" on it to write this review, pretty much killed off my affections. There's a kind of generic department store fragrance counter smell that I think of as "blue man cologne" — I have a feeling that at least some of you will know exactly what I mean — and Vétiver Bleu spends far too long in that territory for me to want to wear it. For a summer-y vetiver and licorice, I'm much happier with Kenzo Air, which I bought unsniffed for a song and don't wear as often as I should. Cartier Eau de Cartier Vétiver Bleu is available in 50 ($67), 100 ($94) and 200 ($125) ml Eau de Toilette. I was vaguely interested in trying this one; I love Goutte de Rose and Essence de Bois. But I know exactly what you mean when you say “blue man cologne” and I’m not a fan. I guess they’re the Cool Water descendants, but to me they feel like the men’s fragrance equivalent of the fruity floral. The go-to, lets not offend anyone, put sport in the name so men will buy it kind of fragrance. I’ll pass on this one. I do love those bottles though! This really is better done than most blue man colognes, and it isn’t a huge aquatic. So, perhaps worth a shot, but Goutte & Essence — I think those are better scents. Robin I am reminded of why I check in on this site daily: Yours and my tastes are sometimes so similar its spooky! 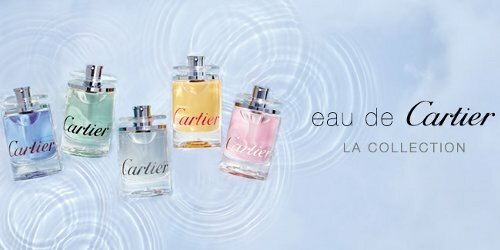 I also have considered buying Eau de Cartier for years (and instead bought other more simpler eaux’s like that Guerlain) and I liked that Zeste de Soleil flanker the most, but I still didn’t spring for a FB. And when I read vetiver & licorice my mind immediately clicked on Kenzo Air before you even mentioned it at the end…lol. I must admit, like annawilde, I love this bottle. It just feels good in your hand. Solid. The bottle is really a classic, and agree, feels good to hold. Oh yes, ‘blue man cologne’, daytime counterpart to ‘gold man cologne’ (slightly sweet and smells vaguely of cardamom). Ha, yes! And there’s green man cologne, of course. I have to say – those bottles together in the pic are GORGEOUS! Ah, then do go try it and let us know if you love it! The colors remind me of the Ann Gerard perfumes! If I see this in a store, I will try it. I feel the same, never been compelled to buy a FB, but I liked one of the flankers, essence de bois. Will try this Cartier of course! The Kenzo does disappear. But to make something last all day, you’ve nearly got to stuff it with the sort of components that make this one smell overly synthetic. But hope you will love it!! i agree that the bottles look nice. i am also a huge vetiver fan, but it sounds like this one is not vetiver-y enough to quench my thirst! To me the trajectory was backwards….smelled more like vetiver in the top notes than at the end.